Who does not know mangoes? sweet fruit which one is favored by many people because it tastes fresh, sweet, and delicious. Mango has a lot of types of its market, one of which is mango podang. This kind of mango that one can only find on the slopes of the mountains willis. At least about 5 district located in the region becoming the largest producer of mangoes podan like cement districts, mojo, Grogol, banyakan, and Tarokan. In its harvest period, sub-districts can produce a sufficient harvest a lot. For example, in sub-districts that have 15 thousand banyakan mango tree can produce up to 20-40 kg in each tree. So in the harvest, banyakan districts can produce about 600 tons of mangoes podang. 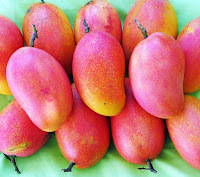 Additionally, mango podang also has different characteristics compared with other mango fruit. If other mango crop requires a considerable amount of water to be able to flourish, it is different than the mango podang. Podang mango instead can flourish and when the sunlight pouring in a state sweltering. If podang mango plants receive too much water supply, instead will make the plants to rot and die. So it has become a cycle when the harvest of mango podang is always done in the dry season. Because of the uniqueness of this podang mango, mango makes Kediri government podang as one of the fruits typical of Kediri. Even now mango podang also exhibited in several countries. Some neighboring countries such as Singapore, Japan, and Korea have high market demand against this fruit. Urang podang mango, mango podang has orange-red skin color and the taste is sweet and fresh. Podang mango pineapple, mango species podang have yellow skin with a slightly sweet taste of fruit acidity. Podang moss mango, mango species podang has a greenish yellow color and its fruit is sweet and slightly sour. But from the above three types of mango, mango podang podang urang a mango species that have attractive look and taste the delicious fruit. Characteristic of mango podang urang can be seen clearly in his orange flesh, its sharp aroma and fruit size is not too large. So the market demand for mangoes is quite high. Besides can be eaten directly, mango podang can also be processed in the form of juice, jelly, pudding, and many more. Benefits Of Mango Podang - But behind the hallmark of the unique and delicious taste, mango podang have health benefits that many people may not know. Podang mango contains beta crytoxanthin. The content is believed to be one of the destroyer of cancer in the body. The content of antioxidants in the mango is also quite high, so that it can lower the risk of cancer spread. Antioxidants are very beneficial to counteract free radicals that became one of the causes of cancer. In addition other ingredients such as phenols, vitamin C, as well as enzymes in mangoes are anti karsiogenik high so that it can keep the body from the risk of damage caused by the cancer cells. Other benefits that can be obtained from mango podang is able to maintain the body's digestive system and maintain the level of bad cholesterol in the body remain normal. This is due to the fiber content in mango fruit podang quite high, about 7 grams per fruit. The effect of decreased levels of bad cholesterol This would be very beneficial for the body. Bad cholesterol in the body can make the emergence of dangerous diseases such as heart disease and high blood pressure. Podang mango fruit is also very safe when you consume regularly. When there are disruptions in many cases of throat and coughing after eating a mango. But for mango podang, rarely found such effects. Well that was the explanation of mango podang as well as benefits in the health field. May the above information can be useful for you.